1) Why is there no prices on some products listed? How much are they? There are no prices listed for most of the products because I don’t feel our society focuses on making well-informed decisions when looking at options. Everyone is either biased against what they consider too cheap or too expensive for a particular item. I don’t want any biases, concious or subconcious, to get in your way of making a well-informed decision if you want to try my products or not. Price point alone shouldn’t be the basis of decisions when it comes to our health and wellbeing. Fill out the order form and add any questions or concerns you may have. I will answer any questions and concerns, and once you confirm you want to make the purchase: For products I have in stock, I will send you an invoice with pricing; for products through my third-party storefronts, I will either create your account and send you your customer account information or explain how you can set it up. Once you login to your account on the third-party storefront, you will see the pricing of each item, how to get the discounted pricing, and confirm your order. Click the link to go create your customer account and then click on place order on the following page after account creation. Some products, those offered directly through this site, you will see the pricing on the order page. 2) Why are your prices “expensive”? Can’t you supply cheaper brands? 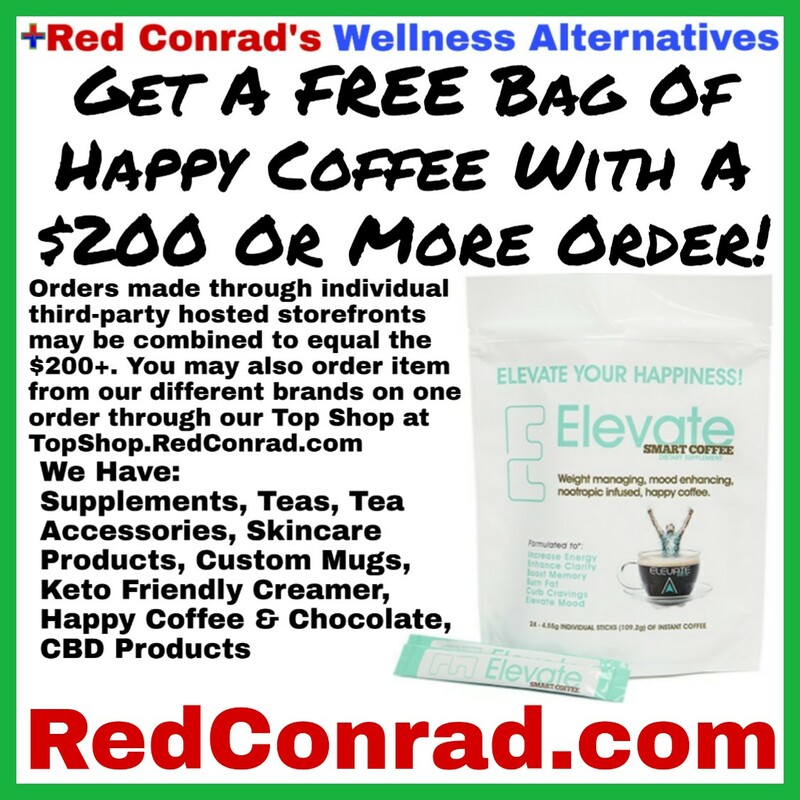 It is the goal of Red Conrad’s Wellness Alternatives to supply the best possible products at the best possible pricing. Where as high pricing doesn’t always mean high quality, the same is true for low pricing. Especially supplements. It also needs to be taken into consideration many product prices you see are for month supplies. When you divide the price by 30 days in a month, many of our products are actually cheaper than conventional brands and other brands that claim to be high quality and non-GMO or organic. At Red Conrad’s Wellness Alternatives, we don’t believe you need to be wealthy to afford to be healthy. Health should be obtainable no matter you’re income level. We also understand many live on a budget, and as such, seldom eat out and rarely visit places such as Starbucks. We mention this because many other brands sales reps will suggest to cut down on such purchases to afford their products. So we hunted down products that are non-GMO and organic sourced at the lowest possible price without degrading the purity and the quality of the product. Through Red Conrad’s Wellness, you will find only the best products at the most affordable possible prices. It is our experience that most brands found in supermarkets, particularly the well-known brands, are garbage. They are chock full of synthetic ingredients and fillers. Supplements of any nature, regardless where the brand is sold and how small the brand is, are garbage if you can get them at $10/bottle or less. Typically anything that cheaply priced won’t even be digestable. Likewise, there are many brands that cost $80 or higher per bottle. In some cases you need to buy multiple products to get the equivalent of a multi-vitamin or the desired benefits you’re looking for. This could quickly add up to $300 or higher per month! Whereas these brands may actually be high quality, it is a serious profit-driven markup. These brands typically cater only to the upper-middle class and upper class of society, coming to anywhere from $960-3,600/yr or higher in supplement costs. These companies suggest you can afford this by simply cutting back on eating out, the number of Starbucks visits per day, etc. And for many, that may be possible. But we understand this isn’t a cost many have that they can cut down or get rid of. How do you spend less on something you don’t purchase in the first place? All of our supplements are of the highest quality and go through rigorous testing for quality and purity. Only organic ingredients are used. And our supplements are third-party certified. As with supplements, many teas sold in supermarkets are by big box brands that mass produce their products for shipment. By the time the teas reach the supermarket for sale and your home after purchase, the product has already lost much of it’s quality. Our teas are all non-GMO and organic, and ship directly to you from the supplier. This guarantees you only have the highest quality, and freshest possible tea. If you taste our teas in comparison to an equivalent from the supermarket, you will see and taste a noticeable difference. Our coffee is one of a few brands that offers the benefits our coffee offers. But our coffee is comprised of only non-GMO and organic ingredients. Our coffee is also proven to provide the benefits we claim it does. No customers have reported not feeling these amazing benefits. No other brand can say the same of their coffee. Your health is an investment, and should be treated as such. You shouldn’t purchase products on price alone. But you should be catious of products that are cheap or overly expensive. Our products are all premium quality at the most affordable possible pricing. Why risk a cheaper product that may not work? Or a higher priced product that may not be any better than ours, possibly not even as high quality as ours? At first glance our products may seem expensive. But to what are you making the comparison? You simply will not find products as high quality as ours for a cheaper price. 3) Are you just several ds (direct sales) businesses or what? Red Conrad’s Wellness is my own brand. It is my business started by me that is supplied by DS companies and traditional companies. Members of my team who join through one of the DS companies work with me, but are paid through the company which they signed up under me in. Each member of my team will have their link appear on this site and they will also have the option of blogging or podcasting with me. As of yet, we do not have a building; just a social media presence, website, and word-of-mouth. So, we guess you can say what our team does is Direct Sales with a twist. We’re not traditional by any means. Some day, we may have storefront locations. Because of this possibility, we only try out and distribute for those companies that allow stock in brick-and-mortar locations. It also gives us and our team flexibility to sell to businesses as well as the individual, if we so choose. Whereas most companies offered here are direct sales companies, some may also be traditional companies. We want this website to be the #1 place to go for all your top quality non-GMO and organic products. So we will only offer the best products at the best possible pricing, regardless of the model the business uses. Every company is personally tested and researched before being added to this website. Because of my desire to offer only the best products at the best prices, we don’t concern ourselves with the business model of the supplier. Some traditional companies have better products and pricing, and sometimes direct sales companies have the better product and pricing. 4) How do the sales work? Do I order direct through this site or use a provided link? It is important you do one or the other, not both. Some products are available both ways, other products are only available for purchase through the provided links. All sales listed on this site will be honored whether you order direct or visit a provided link. The only difference is I may offer an extra package size the supplier doesn’t through the provided third-party storefront. To order such package size, you must fill out the order form on this site. 5) Will you have more products available? Yes. In the future we will have more products available. All products made available will always be non-GMO or organic and be from American based businesses. Keep checking back in or follow the blog and facebook page (there will be announcements). You could also see the current line up of coming products at any given time by viewing the coming soon page. 6) Do you sell to businesses? Can I stock your products in my store/office? Do you sell wholesale? Yes! Our products are able to be supplied for your store, office, etc. Whether the products are supplied by traditional companies or direct sales companies, all products may be stocked and sold through your business. We only offer products from companies that allow such as I’m building Red Conrad’s Wellness into a full-fledged marketplace. Email Red at Red@RedConrad.com for details and wholesale pricing. Terms apply. 7) How did you choose the name for your brand/business? A lot of the good brandables were already taken. I wanted a name that tells people they’re talking to a person, not a company. And I figured why not? A lot of brands are named after the founder, and I don’t mind being the face of the brand so my team doesn’t have to be. As we grow, if we determine a name change is necessary, we can always change it and re-brand. But at least for now, the current name serves the purpose. 8) What products are allowed in the Buy Back? What is Buy Back? How do I recieve my money back? To view the policy, click here. The Buy Back program basically allows you to buy certain products to try and sell it back to me if you don’t like it. The buy back price I pay will be product cost minus the amount you used. The only products that are allowed in the Buy Back are unopened products that do not come individually wrapped, and open packages where the product is individually wrapped. All payments are made after I recieve the product, inspect it, and determine the cost owed to you. All Buy Backs are paid via PayPal. 9) Why, when I pay via PayPal or use my Credit/Debit card, does my statement say “PayPal* Rev. Dr. Red” instead of “Red Conrad’s Wellness”? Currently all non-cash payments are processed via PayPal. Red has a single business account with child-accounts for Red Conrad’s Wellness, Red’s Fresh Fish, his ministry, and his online business. All payments to the businesses and donations to the ministries account will show the name of the parent-account, not the child-account. When paying via PayPal or Credit/Debit, submit payments via invoice you receive or the provided payment buttons. Payments to the online businesses email or to the ministries email will not be considered payment for your order, regardless of the fact they all go to the same parent-account. The organizations funds are seperated and are not connected to each other. All funds do go to the respective place; and if you choose to pay via invoice, you will see Red Conrad’s Wellness information and logo on the invoice. In the future, we may offer additional payment and shopping cart options.